Session: What's Up With The Resurrection? For young people to take time to investigate the Resurrection and think about how it applies to their life. Review the handout to be used in this session. Look up all the passages listed, read and reflect on them yourself so that you are prepared to guide the discussion. Divide into smaller groups of between 6-8 people. Do something creative to divide the groups like group them according the month that they were born, or by the last digit of their cell phone number. Have each person in the group introduce themselves to everyone else in the group, and tell when their birthday is or what their phone number is (or whatever it was that you chose to split them up). Give them a minute or so think of two things about themselves that are true, and one thing that is a "lie." Each group member will then share these facts about themselves, and the rest of the group has to figure out which "fact" is actually a "lie." After everyone has had a chance to share or after about 6-7 minutes, bring everyone back together. What was it like to try to guess the false fact? What were some things that made it easier to determine the false fact? Some answers may be I knew the person, I knew their background, for 'X' reason it couldnÕt have happened, etc. Was it easy for you to create a fake fact about your life that blended in with your life? There are events in history which people can say happened or did not happen, but based on records of history we can determine the truth. What are some ways we know the truth about what happened in Jesus' life? The Bible, writings of historians of the time (i.e. Eusebius), artifacts and archeology, oral tradition that has been passed down through the generation which eventually turned into written tradition, etc. Name some of the things Jesus did during His life on Earth. So did Christ really rise from the dead? Is it something that really happened?Let's investigate. Divide up into groups of 4-6 people. Be sure to distribute the Resurrection handout and Bibles to each person. Ask the groups to spend the next 10-15 minutes working together on the handout. If you have enough youth workers, assign one to each group. If not, just walk around and listen in to the groups to make sure they are moving along in the assigned task. After you see most of the groups finishing up, ask them to wrap things up, and then pull everyone back together. As one large group, review the handout, and have them briefly explain what they have discovered. From what we have just learned from our bible study, there are a few major points. First, Jesus was a real person who lived about 2000 years ago. He was fully God and fully human, and really rose from the dead. These are real events for which we have proof. Second, the Resurrection is the basis of what we believe as Christians. It is what gives us hope that there is life after this world as we know it on Earth. What is the significance about the fact that we as Christians believe in the Resurrection? We have something to look forward to beyond this life. How should this play a role in the way that we act as Christians? To get to that life, we need to start now; We need to prepare ourselves now for that life that we will experience in the life of the world to come. Our lives as Christians should be visibly different than others; prayer life; acts of charity ø almsgiving; fasting, etc. What hope does the Resurrection give you personally? Hope that our lives have meaning; that what we do is worth something; that we are worth everything because we are made in GodÕs image, and will one day be reunited with Him in His Kingdom. What are some challenges that we can place on ourselves to strive for in our daily lives to show that the Resurrection is major factor in our life? Take our faith more seriously, pray more, being positive role models to others, not participating in negative activities such as picking on someone, etc. As Christians, we are called to be different because we have hope in the Resurrection to come. Our lives need to be different than others, because we are preparing ourselves for GodÕs kingdom. We need to follow GodÕs word to serve others, minister to the poor, and to love our brothers and sisters and most of all our enemies. We are called to take the more difficult path sometimes, but that is because the Kingdom at the end of the road is Paradise. Our life on earth is consumed by corruption and violence. 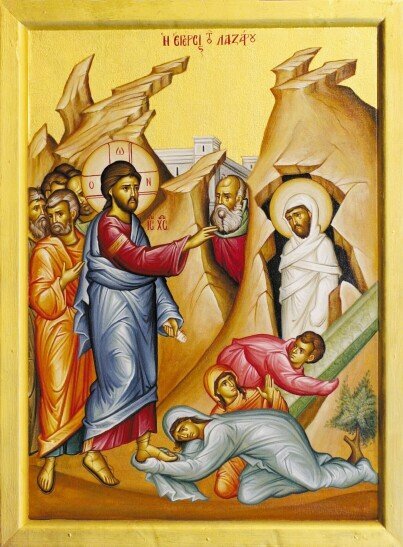 We say in the Paschal Troparion that Christ has destroyed the bonds of death by His death. Without the hope of the Resurrection for us, our lives will be lead to despair. However, for us as Christians, the Resurrection allows us to take the corrupted and sinful world into perspective, and deal with the tough times because we know of the world that is to come. Yesterday I died with Him; today I am made alive in Him. Yesterday, I was buried with Him, today I am raised up with Him. Let us offer ourselves to Him who suffered and rose again for us. Let us become divine for His sake, since for us He became human. Be sure to download, print & copy the Resurrection handout - one per person (PDF Format) - for use with this session.